Somewhere in between the release of Girl at Sea and Suite Scarlett, I'm embarrassed to admit that I think I may actually have forgotten, for just a second, how funny Maureen Johnson is. I mean the hunching your shoulders, tongue caught between your teeth, giggling kind of funny. I read her blog regularly, so I shouldn't be a bit surprised. But Suite Scarlett was even funnier than her previous books. It was like concentrated Essence of Johnson: charmingly and unrepentantly hilarious. They really should bottle it somehow. I also have to say how much I like the cover. This is just how I pictured Scarlett, right down to the platinum curls, red lipstick, and Lola's little black dress. Scarlett Martin's life is slightly different from most 15-year-old New Yorkers' lives. She lives in the Hopewell--an old Art Deco hotel her family has run for generations. On the morning the book opens, Scarlett celebrates her birthday and learns that they've had to let go the last employees they had. She, along with her three siblings and two parents, will now be expected to keep the mouldering old place running on their own. Good thing the Martins are good at keeping up appearances. Oldest daughter Lola works at the makeup counter at an upscale department store and maintains a relationship with boyfriend Chip, otherwise known to the family as "#98" for his inclusion at the bottom of the top 100 happening bachelors in the city. Grin. Brother Spencer is a desperately aspiring actor gifted in physical comedy. Spencer is always mock falling down stairs and into doors. He is on a deadline to acquire a "real" acting job within the next week or his parents are shipping him off to culinary school so he can be the hotel cook upon graduation. With Scarlett's help, however, Spencer is determined to avoid this fate worse than death. Lol. So if you're a devoted follower or if you've never read a Maureen Johnson book before, this is definitely the one that you want. Maureen's books are a hoot and a half, but one of the reasons I enjoy them as much as I do is because they always feel real - there's humanity there, motivation and gray areas and seriousness behind the silly and the witty bits. 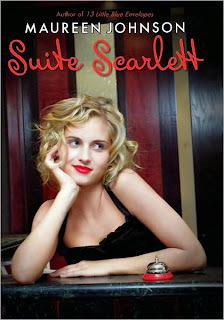 Speaking of Suite Scarlett, did you know that it was picked as one of the Night Bites books for readergirlz event in October for Teen Read Week? Maureen and the other authors of the selected books will be chatting live at the readergirlz forum. It's going to be a blast. You should come! I passing, I believe that MJ got to have something to do with picking the model on the cover (vastly unusual for an author), so that may be one of the reason's it looks so much like Scarlett. Ooh, thanks for the heads up Little Willow. I'll make sure to be there. Maureen Johnson isisis....amazzzzing. To put it very simply. I think I've read everything that's out by her, but it just isn't enough. You bet, Aella. I can't wait for the sequel to Scarlett!